The 2015 General Election is upon is, and despite an uptick amongst registration amongst young people, turnout looks set to again be lop-sided in favour of older voters. In a valiant attempt to contribute in their own small way, the TV channel E4 have pledged to switch off the channel in order to encourage their (generally younger) voters to go to a polling station. Richard Berry argues that this is a bold move, but it may actually backfire. It’s a bold move, but one that may well backfire. We hold elections on a weekday, when most people are busy with other things – research has suggested that a weekend election could see turnout rise by up to 10%. Our polling stations are empty, unwelcoming environments, in contrast to Australia, where polling stations double as community fairs, transforming the whole event into a celebration of democracy. The counting of votes at British general election is for some archaic reason conducted overnight, meaning that the declaration of the results is an event viewed only by those political junkies willing to stay up all night listening to David Dimbleby. Channel 4 has at least ensured that a few people will notice that something important is going on. But what is the content of the message Channel 4 is sending, and how will it be received? When we ask this question, some of the fundamental flaws of the Channel 4’s approach become apparent. There have been many different campaigns and initiatives aimed at increasing youth election turnout in recent times. So far none has employed this pleasure-denying technique that Channel 4 has hit upon. In practical terms, of course, depriving the public of one TV channel means absolutely nothing. 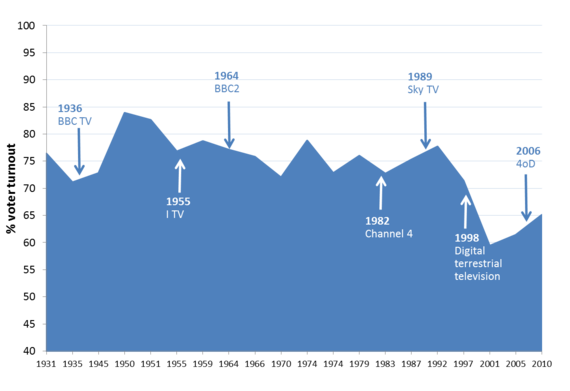 Although the increasing number of channels available to viewers in recent decades is loosely correlated with the decline of general election turnout (see chart), it would be far-fetched to suggest people are failing to vote because they are too busy watching TV. Even if there was a weak causal relationship between the two, viewers will still have hundreds of channels to choose from on 7th May. Indeed, they’ll be able to watch as much Big Bang Theory and Brooklyn Nine-Nine as they want on Channel 4’s on-demand service online. The purpose of switching off E4 is to send its viewers a message. Most public policy interventions of recent years aimed at increasing democratic participation have focused on this form of exhortation – telling people to vote, reminding them how, stressing how important it is. At times these efforts have had an air of desperation about them – one poster campaign this year has informed young people that joining the electoral register will make it easier for them to get a mobile phone contract (see picture). Channel 4 has simply taken this approach to a new extreme. The problem is, there’s no sign that exhortation works or that it ever will. It could be counter-productive. There is obviously value in giving people a helpful reminder, but that will only reach those who were already intending to vote, or at least those open to the idea. If that would-be E4 viewer is already cynical about politics, then having the rich, middle-aged, establishment figures that run Channel 4 tell them so bluntly to to go and vote is likely to risk further alienation. Even if they are not particularly cynical, but simply lack knowledge of the process or the candidates, telling them to vote on election day is far too little, and too late – arguably, it would have been more effective to switch off E4 on 20th April, the deadline for registering to vote. E4 could have used a much greater proportion of its airtime over recent months to show programmes aimed at encouraging participation. Even the aforementioned young party leaders debate hasn’t made it onto the air – it can only be streamed online. Advertising space could have been made to offer useful information for young voters. Even though Channel 4 is a commercial entity, it is state-owned, and there’s little point the state owning Britain’s most popular digital channel for young people if it can’t use it to help inform them at election time. And why not commission more shows that portray politics in a more engaging way? The number of dramas about politics is very small – certainly compared to those about the legal system, police or medical profession. When it does feature, politics and politicians are shown at best as ineffectual, and at worst as corrupt and scheming. We need a significant in how we provide political education and information in the UK. This patronising, panicky intervention from Channel 4 is not a step in the right direction. Note: this post represents the views of the author, and not those of Democratic Audit or the LSE. Please read our comments policy before posting. It also appears on the Huffington Post UK.